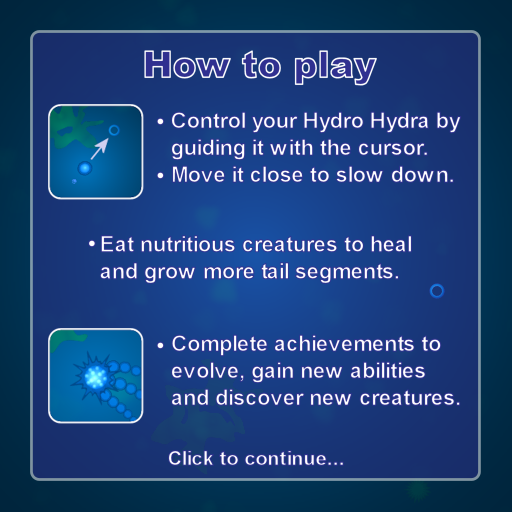 I have now for quite a long time been working on a remake of my older game named Hydro Hydra. The game has been rewritten from scratch, using a much updated version of my game library. in order to grow into the mightiest creature of the all! Now has an auto-save feature. New achievement system (interacts with the game). Performance increase and stuttering fix. Increased stability and system support. Hopefully improved graphics and audio. Decreased size using ogg vorbis compression. Game design, programming, graphics and user tests are all made by me. I would like to hear as much feedback as possible, be it positive or negative. At the time of writing I'm working on the audio with Bjørn. I'm not quite sure what to do with the title in order to avoid confusion with the older but (very) similar version. I feel it's a remake rather than sequel, so calling it Hydro Hydra 2 seems false(?). Really fun and well polished game! Great job! One small complaint, how do I tell if a "creature" is good or bad? Instead of a subtitle you could just add another word(s) to the title, e.g. 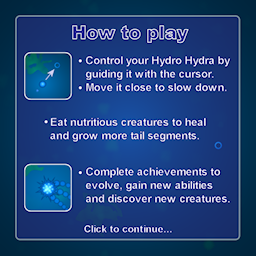 like 'Hydro Hydra Ultimate Edition' or 'Hydro Hydra Extreme', 'Hydro Hydra Rebirth', 'Hydro Hydra Evolution', etc. I'll try to come up with better ways of explaining it. Anyone have any idea what is causing this / how I might fix this? I did get a "Do you wish to block this code" message which you have to click "no" to, maybe Apo clicked "yes". To get rid of that message, Scarzzurs you need to sign every single jar file. IMHO it's much more fun to discover that by trial and error. Hehe no I didn't click yes. On my desktop pc at home everything works fine. The Java version on my laptop is Java 6 Update 26. 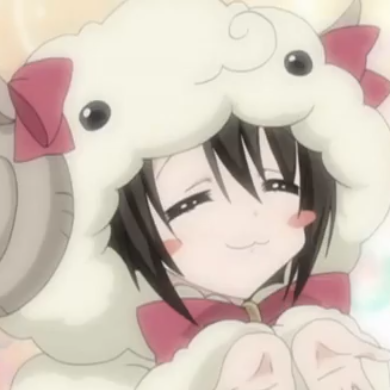 And I agree with Riven it was fun to discover what is good and what is bad. played the game, its really nice and already much better and more polished than the original Hydro Hydra (which is featured). Therefore only logical to also feature this. Yeh, that's what I thought before as well. However a lot of people mention this stuff, so there might be something to it. At one point I thought about implementing a mode selection between "explore" and "guided". Hmm, I just updated to Java 7 and still don't see any errors. I've self-signed all the non-LWJGL jar files used using the same certificate. I played for thirty minutes, and now I'm totally chilled. 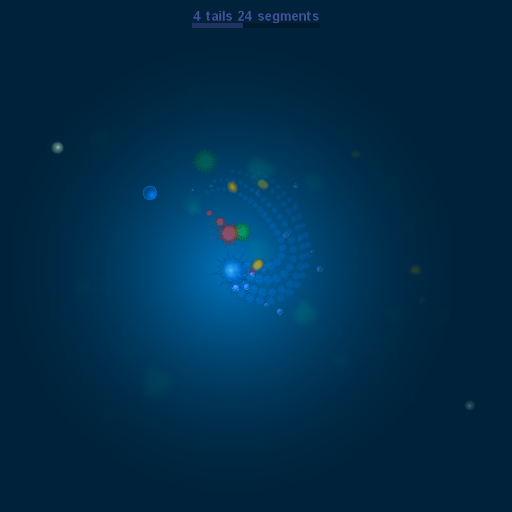 It's a lovely, ambient, Osmos-y game. The "How to Play" screens felt like they contained too much text (and didn't make much sense at the time since I read them before playing the game). Pruning the text, using pictures instead of words, or somehow delivering the information in-game would be good if you can do it. The creature colours in the game are not very distinctive. In particular, the green creatures look a lot like the background. Fair enough, I can believe this is a deliberate design decision (to give the game a murky-depths feel), but I figured it's worth mentioning. I didn't feel there was quite enough feedback telling you whether you're doing something good (eating) or bad (getting hurt). This doesn't help when (as others have said) you have to figure out by trial-and-error what the other creatures do. In particular, it was only when I looked at the "Achievements" screen that I realized I wasn't supposed to be running away from the pink creatures. Similarly, I was surprised to realize that I'd lost a tail (and effectively gone back a level). Seems like something I should've noticed (sirens, flashing red lights, etc.). In your description of the game above: "grow into the mightiest creature of them all!" Well, that happens very early on! How about having some scary-big versions of the nasties float by from time-to-time on later stages to give you a sense of how much you still have to grow. 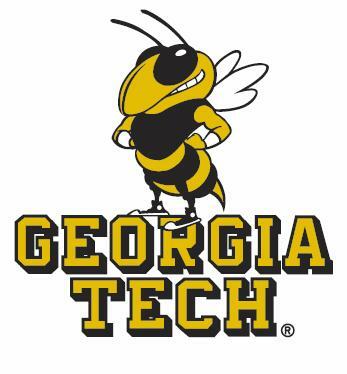 I didn't like the look of the cursor. I don't know why, it just looked out-of-place somehow. I felt that there was a bit of tension between the relaxed, almost goal-less, drifting around, and the sudden "Achievement" and "Stage Complete" screens that pop up. Like on the one hand the game is telling me to chill out, and then it's all: Do Stuff! Now! Right up until the game started I thought it was going to be a shoot-em up. I don't know why, but for some reason the title Hydro Hydra makes me think Bullet Hell. Not that I'm expecting you to change the title, but... well... maybe. The "How To Play" screens: I will try to cut down the text as much as possible, and see if I can get some pictures in there, like you suggested. However I have been hesitant to add picture since the in-game graphics are subject to change, and I was trying to avoid doing the same screenshots over and over. However, I believe you are right in that they will lighten and clear up the information. The feedback issues: It is my hopes that audio will be able to generate this feedback that you and many others miss. If that fails, I will have to see what I can come up with. The cursor: I've tried to figure this one out of couple of times, but never really came up with something better, so I am open to ideas here. I am still not sure what it is that makes it seem out of place. Is it the figure? Is it the color? Is it the blend mode? Creatures vs background: I might be able to make the shapes more distinct by adding a fatter cartoon-like border to creatures shapes. However, I believe I have tried something similar before with little luck. I will try it again, never the less. Lack on anticipation I am not sure how I would be able to show the larger creatures beforehand. Screenshot in the How To Play screens can do this to some extend, but at the same time, it's only very few player who reads these. I could also do what was done in fl0w, showing the larger creatures in the background. However, my personal pride and respect for that game is holding me back. Also, it would take some work, if I was to have parallax scrolling on these background creatures. Wow... I was afraid this would happen. You have pretty much pointed out every fear and concern I have recently had about the game. Oh dear. As I was writing that message I did think maybe I was being too negative. But overall I thought the game was of such a high quality that it was worth pointing out every tiny niggle I could find (and they are all tiny). I'll reply to specific points later when I'm home from work. Haha, it's quite alright, I didn't see it as such. I often prefer the negative feedback as it seems to put focus on the things that can break the game. On a side-note, I've received more audio to be implemented today. Audio's good. Also maybe making the status info at the top of the screen glow (white for good, red for bad) when something happens, or possibly changing the colour of the player or the background. Or maybe just exaggerate the existing effects -- obviously you've played the game much more than anyone else, so effects that look obvious to you are quite subtle to the rest of us. The cursor seems bright and hard-edged compared to everything else. But then if it were duller and fuzzier it would look like just another game creature. Maybe you could use the same sort of colour scheme as in the rest of the game, but with an abstract cursor shape, like six dots spinning around in a circle, or the head of an arrow (pointing in the direction the player's moving)? Maybe just try making the creature colours a tiny bit brighter (or the background objects a tiny bit darker). If that doesn't look better then forget about it. Maybe a slow transition in and out of the menus would be enough to maintan the mood: the sound starts changing, the status text at the top of the screen changes, the game slows down to a stop, and finally the menu appears, with the whole transition taking maybe two seconds. Lack on anticipation I am not sure how I would be able to show the larger creatures beforehand. Screenshot in the How To Play screens can do this to some extend, but at the same time, it's only very few player who reads these. 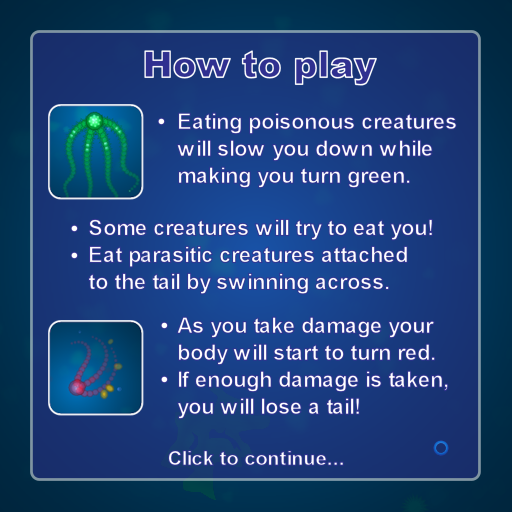 I wouldn't explicitly show any creatures on the "How To" page, except the ones that appear in the first couple of stages. If you want to describe other creatures then maybe you could only show part of them. The player should have to work for the full reveal! 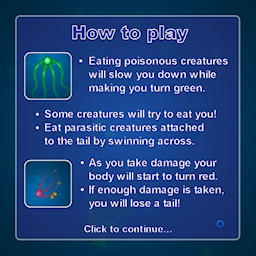 When a new game rule is introduced at a later stage (e.g., run away from red things) could that be explained by a special help screen at the start of that level? I could also do what was done in fl0w, showing the larger creatures in the background. Actually for the larger creatures, I was thinking more along the lines of having (e.g.) a red creature that's twice as big as the player, but slow-moving and not interested in chasing the player -- at least not until the player gets bigger! Well... I think I noticed it before I started playing, and decided not to risk it (I've had crashes running games fullscreen in the past). Then I forgot it was there. I tried it out just now, and it works fine, and the game looks even prettier and feels much less cramped. I don't think it would hurt if you increased the default window size a bit though (making it wider especially). There can't be many computer screens left that couldn't show a bigger window. im the sound guy on this, and finally got myself an account on this site, after trying to figure out those "let me in" questions. Any comments on the sound is more than welcome. Also maybe making the status info at the top of the screen glow (white for good, red for bad) when something happens, or possibly changing the colour of the player or the background. The cursor seems bright and hard-edged compared to everything else. But then if it were duller and fuzzier it would look like just another game creature. I will try making it blend in more for my next experiments, though I have the same concerns about it. I tried out changing opacity and lightness of the background object. However it appears they help against sea-sickness, so they must not blend too much. Maybe a slow transition in and out of the menus would be enough to maintain the mood: the sound starts changing, the status text at the top of the screen changes, the game slows down to a stop, and finally the menu appears, with the whole transition taking maybe two seconds. [...]I don't think it would hurt if you increased the default window size a bit though (making it wider especially). There can't be many computer screens left that couldn't show a bigger window. Aight, I catch your drift, I'll take it into consideration for future releases. I'm working on adding optional shaders to the game. I've had some problems with upside-down shaders on some machines, that I am working on fixing. The current version of the game only has a "water ripple warp"-shader for the green foreground thingies enabled. I'll try to look into the "game-slowdown during menu" idea and add/adjust more audio later this week. What might be nice is a degree of control over what evolution your creature undergoes. I know you get to select what upgrades but it doesn't make too much difference and the end result is always the same. Got 12 tentacles with 65 segments. I fail to see what having more segments and tentacles actually do though. 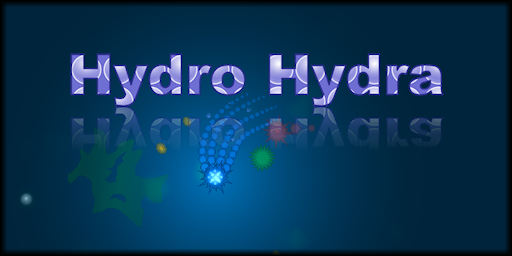 Hydro Hydra - 2nd Dive released! congratulations! hmm, didnt know people sold games on the webstore? can you do us/me a favor and keep us posted on success and viability of webstore? thanks . What's the difference between this version and the one you posted in the past, if any? Hmm, I have very low expectations. However, if the game gets some interest, I might add another creature/stage. The Chrome Web Store does not favour new games in any way, so if you're not Big Game Company(tm), you get no downloads just because you're in the store. The store is made for websites or things that appear that way. This means that not only does it seem weird to the user when you instead supply them with a jnlp, but there are some problems that seem to have gone unnoticed: Sometimes the jnlp download disappears after you have clicked the app in the browser, leaving only the browser unsafe download security dialog. My solution to this problem is to simple redirect the user to a download page on my website, where I can then explain what's going on to the user. It is my hope to add the game as an applet on this page directly, but I seem to have struck a lwjgl bug with this approach. On the positive side the store serves as payment method for my game, leaving me without many worries. It was also good to experience actually selling a game for the first time, no matter how ridiculous the sales count is. I'd try add the game to a few more portals (just throw it at all of them until it sticks somewhere ), Desura, Indievania, Gameolith and GamersGate seem like nice targets for small indie devs, some other targets for LWJGL games available here. A non browser-specific payment method would be really nice.